We now have seven blueberry bushes, and we deliberately chose a mix of low and high bush as well as a range of production times, so in the future we hope to have early, mid, and late season blueberries harvests. 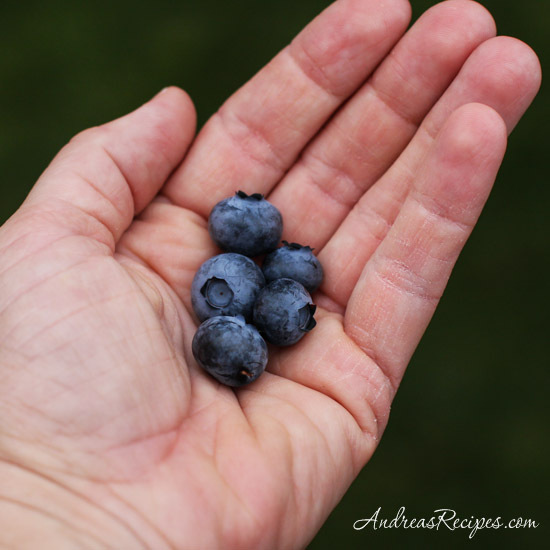 This morning we gathered the first blueberries of the season, though there weren’t as many as I had hoped. We had a little storm come through yesterday which knocked our blueberry cages about, and the birds found an opening and took advantage of it. We were happy to have enough for the salad, but now I have some work ahead to set the cages back in place. The birds and squirrels like ripe blueberries as much as we do, and hopefully we’ll beat them to the next round. Fruit salads find their way onto our menus frequently during the summer, and we have a lot of fun mixing flavors and trying different combinations. Mangos are also in season and we tossed them with our fresh homegrown blueberries and a ginger syrup with rice vinegar. The boys really liked the sweet and slightly sour combination and devoured it with their afternoon snack. I wrote the recipe with a full batch of simple syrup because I like to keep it on hand, but you can also reduce it by a quarter to make the precise amount for this salad. This is my post for Grow Your Own, a blogging event that celebrates the dishes we create from foods we’ve grown, raised, foraged, or hunted ourselves. I hope you will join us! I am hosting the June event and you can send your post information to me at andreasrecipesgyo AT gmail DOT com. If you are new to the event, you can read more about the rules for participating at the Grow Your Own page. The deadline for sending posts is June 30. 2. Add the sliced ginger root to the hot 1/4 cup of syrup, allow it to steep for 10 to 15 minutes, then remove the ginger slices. Let the syrup cool to room temperature, then chill. 3. Add the rice vinegar to the syrup and stir well. Toss the mango chunks and blueberries together in the serving bowl, then drizzle the ginger vinaigrette over the fruit. Gently toss again and put in the refrigerator to chill for about 30 minutes. Serve. Ah blueberries, one of my favorite fruits. Wish I handful now with my morning coffee here in Germany. 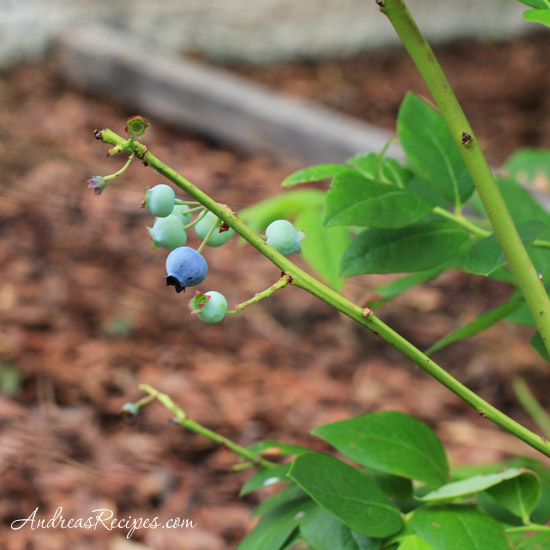 Such vibrant colours – i love fresh blueberries and mangoes…2 of my fav fruits! So flavoursome! Too bad they’re not in season here in Aust. Simply divine Andrea! Love the ginger addition. Gorgeous! I’ve just realized that I need to buy cages/nets/whatever if I ever intend to get even a handful of blueberries from our bush. The birds get every single berry. We can pick our own at farms around here, but unfortunately they’re not organic. Thanks for linking to my parfaits. Much appreciated! Perfect timing on your recipe. My husband walked in last night with a box of mangos that he got a “good deal on”. 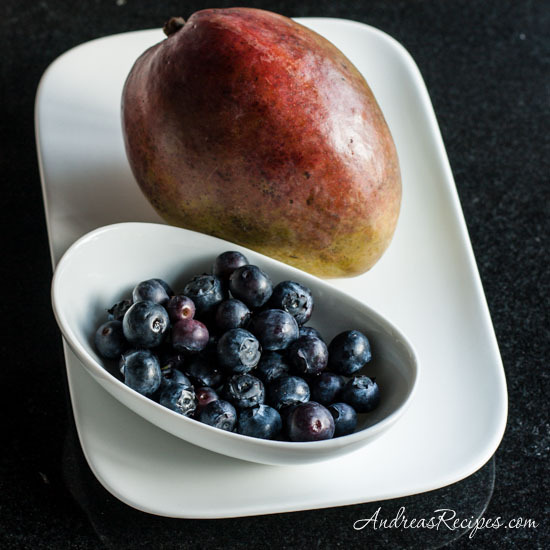 So now I have about 30 mangos that I need recipes for…Hello Mango Blueberry Salad with Ginger!!! Wow- what eye-popping color. I’d love to serve this with some agave-lime salmon. Beautiful! That looks fabulous. And I had the same thought as Karina, great colors together! Beautiful! I adore a perfectly ripe mango. what a wonderful colourful salad! 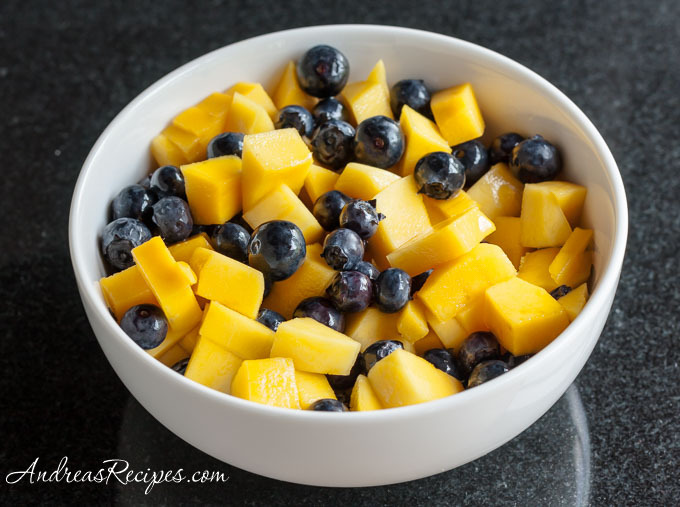 Mangoes, blueberries and ginger are three of my favorite things, and here they are all in one bowl. This was great, even for breakfast, because the vinaigrette was so mild. Yum!